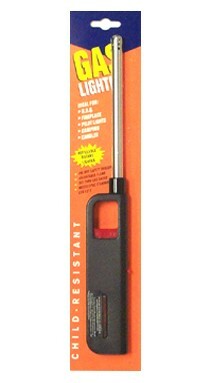 Long-nose fireplace lighter. Refillable. Hang-able. Average Customer Review: 4.5 of 5 Total Reviews: 4 Write a review to tell others what you think about this item. Shipment was received ahead of schedule, in perfect condition, and items work well, at a giveaway price. the one in the illustration was not what i received. these have the childproof mechanism unlike those shown. darn it. it is refillable and it has no childproof lock. a great deal.